I am lucky to live in Bend, Oregon with my very patient husband, wonderful daughter, and our menagerie of cats, dogs, horses, and chipmunks (and anything else I can feed!). I spend my time drawing, painting, riding horses, drinking coffee, and looking out the window of my studio. I also like to write children's picture books. And I'm training to be a ninja. I began my art education with my first easel at age 5, but it took me a long time to become an artist. I grew up in the tiny beach town of Shelter Cove, NJ (near Toms River) where I spent my childhood days dragnetting, crabbing, and swimming. I wanted to be an artist. I also grew up in Eastern PA where I spent time riding horses and drawing pictures. I wanted to be a horse trainer. I went to college where I studied Marketing and Art, and graduated with a degree in Marketing. I also went to Flight School and earned a bunch of ratings. I became a professional pilot. My favorite jobs were air ambulance pilot and seaplane instructor. I painted in the hangars between flights. From time to time I have taught horses, and riders, to jump fences. Finally, I became an artist (but really, I have always been one). I have been represented by many fine galleries in North Carolina, Nevada, and Oregon. 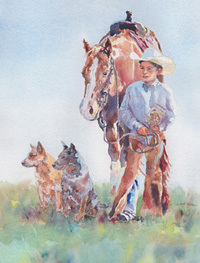 I am a member of the Society of Children's Book Writers and Illustrators, Watercolor Society of Oregon, American Watercolor Society, National Watercolor Society, and Arts Central. I work in watercolor and graphite. My favorite subjects are animals, kids, and everyday life scenes. Much of my work is commission based, which requires me to listen, follow directions, and meet deadlines. For more information on commission work please see my Commission Process page. Most paintings and giclee prints available for purchase are listed with the artwork. If you have questions or comments, or a job for me to do, I'd love to hear from you. Unless specified otherwise, all images on this site are the sole property of Wendy Myers and may not be used without permission.